Have you ever walked into a doctor’s office – or any business – and wondered if you were in the right place? Why did you have to second-guess yourself? Was it a good first impression? Jane, your newest patient, parks out front and approaches the door. She hesitates a bit, not sure if this is the correct entrance to your clinic. Once inside, there is a clean, basic waiting room with ample seating and a front desk at one end. Jane approaches the desk and is told to sign in and wait for her name to be called. She takes and seat and starts checking her phone and scrolling through messages. After a few minutes, she is given a pack of new patient forms to complete. Shortly, her therapist greets her and it’s off to the first appointment. That night, Jane goes online and leaves a Google review with 3.5 stars. Why didn’t she give you 5 stars? Let’s see what her first impression would be if the practice had some key marketing essentials in place. Jane, your newest patient, parks out front and approaches the door. The door has your logo on it and a Welcome sign out front, letting her know that this is the right place. Inside, Jane is greeted by a receptionist saying, “Welcome to ABC PT. Please sign in and I will be with you in just a moment.” She takes a seat and notices some bright, eye-catching posters on the walls and a rack of brochures about the services offered. On the table, there are some extra practice newsletters for her to read. When she is called to the front desk, the receptionist hands her a branded folder with all her forms and key practice information. Shortly, her therapist greets her and it’s off to the first appointment. That night, Jane goes online and leaves a Google review with 5 stars. Throughout her first visit to the clinic, Jane was actively engaging with the practice’s marketing. From the door signage to the new patient packet, the practice made sure to leave a great first impression. That is 5-star office marketing! Ensure that your office is easy to find once your patient is in the parking lot. Put your logo on the main door and include an Entrance sign or Welcome mat. Some locations, such as those in shopping malls or in office complexes, are hard to find. Consider an A-frame sign to help patients locate your clinic. 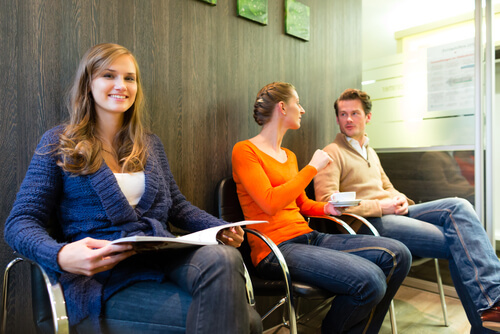 These are some examples of easy ways to successfully market your clinic. Take small steps to building your office’s branded materials and practice marketing—start with training your team on greeting customers and build up to brochures and patient packets.